People: 95% European descent and Mestizo, 5% Indian. Language: Spanish and a handful of native languages, including Aymara, Mapuche and Rapa Nui. Religion: 89% roman catholic, 10% protestant, less than 1% jewish. It extends some 4.300 Km from the desert north to the glacial south; is bordered by the Pacific Ocean on the west and shuttered by the Andes on the east. 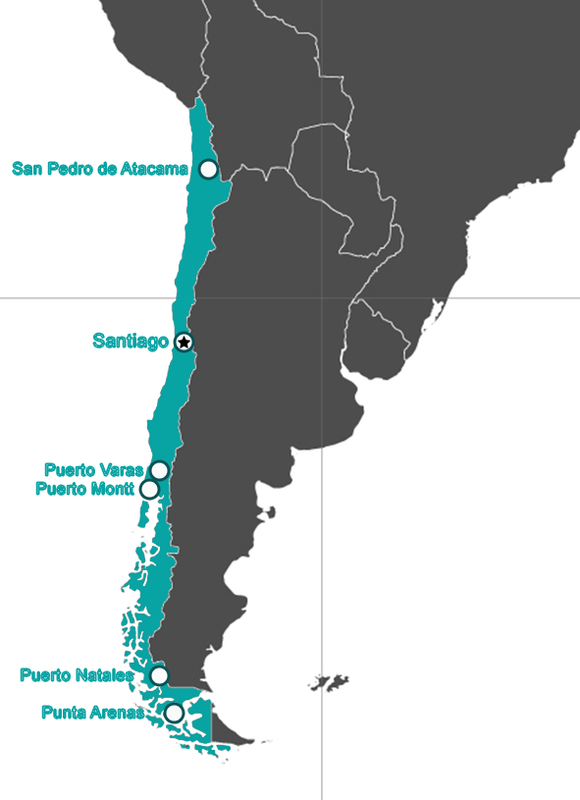 Chile shares most of its extensive eastern border with Argentina, and borders Peru and Bolivia in the north. Rarely extending beyond 200 Km in width, Chile makes up for longitudinal mincing by rising rapidly from sea level to 6,000 mts. The country's latitudinal extremes give it a formidable array of landscapes: snow-capped volcanoes plunge to river canyons. The Great North, where some weather stations have never recorded rainfall, is opposite to storm and snow-prone Patagonia. Chile's razored and sculpted coastline has endowed it with beaches and bays perfect for fishing and swimming. Chile also lays claim to the offshore territories of Easter Island (Pacific Ocean 3,700km west the costline), Juan Fernández (700 km west) and half of the southern island of Tierra del Fuego (which it shares with Argentina). The variety of habitat supports distinctive flora and fauna, which are protected by an extensive system of national parks - one of the country's major draw cards for visitors. In the parks, animals such as the endangered vicuña (a wild relative of the alpaca), the Patagonian guanaco (a wild relative of the Andean llama), flamingos, pelicans, penguins, otters and sea lions do the food chain work. Chilean plant life includes stands of araucaria (the monkey-puzzle tree), cypress and rare larch trees (similar to the giant redwoods of California). Outside protected areas, extensive logging denudes the landscape at an alarming and increasing rate. Chile's climate is as varied as its terrain, with arid but surprisingly temperate areas in the north, a heartland which enjoys a Mediterranean climate, and the wind, rain and snow-battered lands of Chilean Patagonia and Tierra del Fuego (Fireland) in the south. The rainy season in the heartland is from May to August when temperatures are cooler, getting down to an average maximum temperature of 10ºC (50ºF) in July. January's average is 28ºC (82ºF). Chilean Patagonia and Tierra del Fuego have summer averages of just 11ºC (52ºF). Departure along the south bank of the Llanquihue Lake, straight towards the Osorno Volcano through Ensenada, entering the Vicente Pérez Rosales National Park. Reach Ensenada after about 50 minutes by car, the easternmost port on the lake. 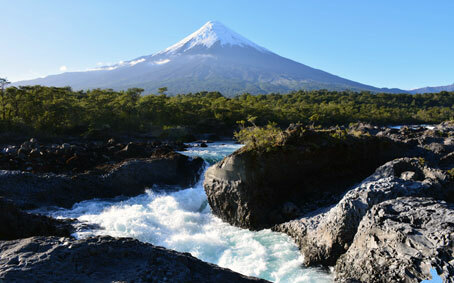 Face the imposing Osorno Volcano, a symbol of the local landscape. Walk through a forest of coigües and other native tree species, making a stop at 1,000 meters of altitude to observe La Burbuja Crater, admiring the view of the Petrohué River valley and the Calbuco Volcano in the magnificent Andes. The expedition continues to the ski center and its cafeteria located at 1,200 m.a.s.l. ; and where you can access the ski lifts (not included) that will allow you to better observe the landscape. On your way, see how the lava formations from earlier volcanic eruptions were formed. Stop and enjoy a panoramic view from the top of the Osorno Volcano.